You and I have very similar office routines in the morning! I always go to my desk, start my computer and put my stuff down, then bring my mug for tea, water bottle, and lunchbox to the kitchen. Someone once told me to drink half your body weight in ounces of water per day, so I shoot for that at work and the gym. My water bottle is 33.8 oz, so I have to fill it up twice – it’s actually nice because that means I get a little bit of movement in my day. Loved this post. Great ideas to make hydrating a real part of an everyday strategy. Very insightful. Great ideas! I’m a huge tea drinker, so I always drink a lot of it in the morning, and I get enough caffeine to function without acting like a crazy. Then I switch to a metal water bottle for the rest of the work day. After work, I make sure to carry a glass or bottle with me everywhere. If it’s in front of you, you don’t forget! 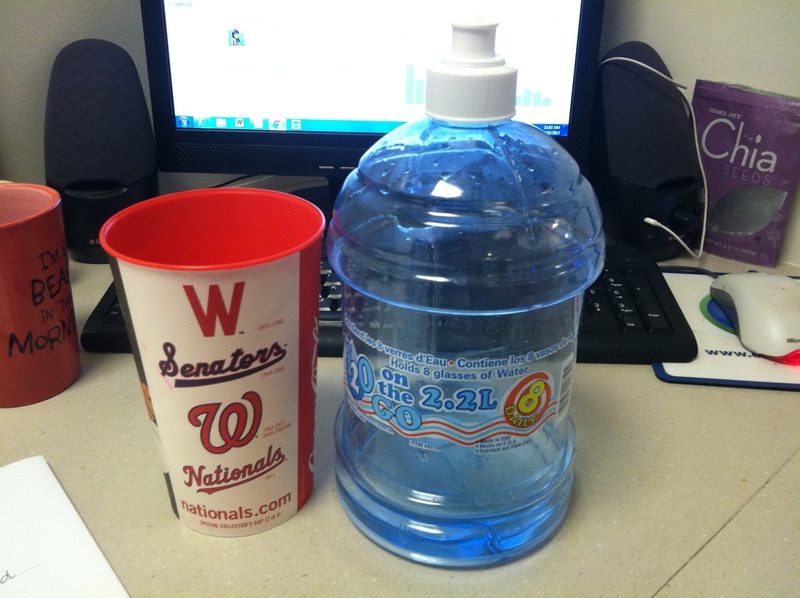 I love my Contigo water bottle – I can get a lot of water at once! I fill it up about 3 times a day for a total of 72 oz. I’m in the market for a new water bottle to travel with… I will have to check out Contigo!